Seems quite a few folks have been talking about it ever since. I've mentioned several times now about this new series of Uncut Magazines coming out in the UK running vintage articles from back in the day that first appeared in Melody Maker and New Musical Express. They've done tributes to each year in rock and roll history (I believe the series currently runs from 1965 to 1974 or 1975 ... but the older issues are getting harder and harder to find) as well as special spotlight issues devoted to a particular artist. "Pray For Surf" Phil told us about a Beach Boys edition so we had to go and pick that one up right away. (Barnes and Noble seems to be a safe bet to find these ... but truthfully I've probably ordered most of my copies online because they're just so hard to find.) 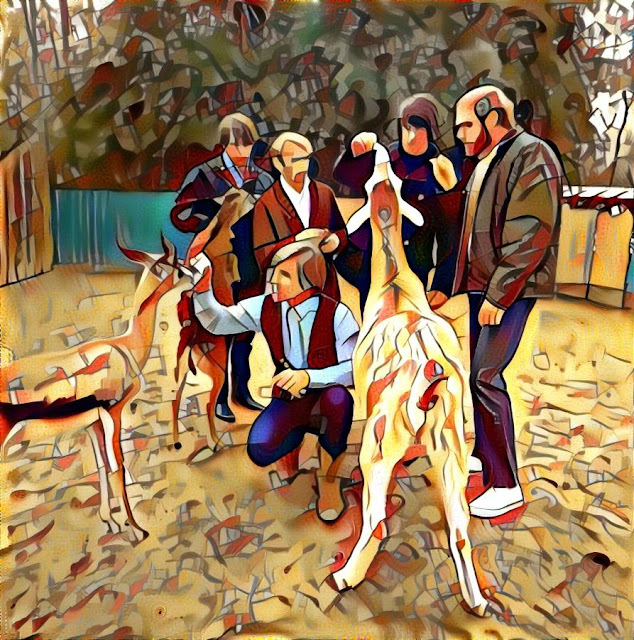 In addition to in-depth reviews of every Beach Boys album there are a series of articles from way back when profiling the group during their mid-to-late '60's hey-day. One that really caught my eye was a piece on Beach Boys Dad Murry Wilson, who was over in the UK promoting his new album "The Many Moods Of Murry Wilson." What's interesting is the fact that this article first ran in November of 1967, three full years after Murry had already been fired as manager of the band ... so to say that this comes across as slightly delusional is probably the understatement of the week. He certainly seems to credit the greatest part of the group's success to himself, however, even at this stage of the game. Here it is as it appeared then ... and now in this classic reissue magazine (with a few comments from me thrown in, as is always my nature!) Remember, these are Murry's words and observations AT THAT MOMENT IN TIME regarding the evolution of the group. When The Beach Boys first started, they made a record called "Surfin'", written by Brian and Mike Love. It was a smash all over the States, but three and a half months later, The Beach Boys, as far as the music business was concerned, were through. The boys were crestfallen. They did not want to be a one-record group but the Hollywood record companies didn't want them. They asked me to manage them and I went off to see the companies. I went into Capitol's offices and fortunately a man there remembered my name from a song I had written eight years before. Capitol took the boys on. With Capitol, the group had a string of worldwide hits and were unique in that one side of their records had started a surfing music trend while the other had sparked off a hot rod music trend. Two trends on one record. First of all, "Surfin'" was NOT a "smash all over the States" ... nationally it peaked at #75 in Billboard and was a regional hit at best in the Hawthorne and surrounding areas of California, where surfing actually meant something to people. After the group's second hit, I told them I would have to go back to my business, but they begged me not to. I said I would stay if they would obey me and they agreed. Really all I was doing was harnessing Brian's talent and the talent of the group ... and coaching them in humility. So many groups come on strong after success. I didn't want my boys to be like that. Murry stayed with the group ... and watched his own machinery business fail. "I didn't take anything from the boys in the first year. It seemed immoral to take from your own sons. In 1963, I got ten per cent in royalties from their concerts." Today Murry has more money than he has ever dreamed of. What's odd about all of this to me as that we've seen history rewritten hundreds if not thousands of times 20, 30, 40 and 50 years later ... but this was a blatant case of Murry Wilson "massaging the facts" as they were happening. Just what is (or was) rock 'n roll? I don’t mean today's lackluster milquetoast, but the tunes we grew up loving ... songs that are just as important to us now as they were 40 or 50 years ago. I don’t really have a concrete answer. I just know I still love Big Mama Thornton, Chuck Berry, Elvis and Jerry Lee. Plus, I still foot stomp when I hear the Bo Diddley beat. Who doesn't? But, rock 'n roll has its own B-side. It’s a mood of sadness. It's musical poetry that provides a mirror to your soul. It's a melody you hear late at night that reminds you of moments that seem unforgettably special or, perhaps, almost sad beyond words. Here's an offbeat example. George Harrison's work on "While My Guitar Gently Weeps" always leaves me second guessing a relationship I had in 1969 with a girl named Judy. She had enough common sense to ditch me. So, for the hell of it, while I prepare my new book on former Bears' linebacker Otis Wilson, I decided to name my top 10 musical tear jerkers. Somehow, I left off the Monkees' "Pleasant Valley Sunday" and the magnificent "Transfusion" by the unforgettable Nervous Norvus. The whistle has been blown. Let the criticism begin. 10. Frank Sinatra - "One For My Baby (And One More For The Road)." Frankly, the studio version of this gem bores me but I had the good fortune to see Blue Eyes perform "Baby" about a dozen times in concert. As a live song with Frank bathed in the spotlight, it's simply the very definition of brilliance. I know its pop but hey, my house, my game, right? Michael Stipe, you nailed it - big time! 8. The Flamingos - "I Only Have Eyes For You." Call it doo wop, call it musical magic. Seriously, I would love to have the song played at my funeral. 7. Marshall Tucker Band - "Heard It In A Love Song." Sure, it’s a mid range tempo, but the bridge with the flute and piano solos are remarkably moving. Listen closely to the lyrics. The guy who wrote this Southern masterpiece can never find happiness. 6. Bruce Springsteen - "Philadelphia." Recorded around the time the boss's voice was truly becoming all-out ballsy. Bruce was born to record this number. 5. The Beach Boys - "In My Room." Brian Wilson's gripping slice of uncertainty about the ups and down of growing up. I actually rate the song a notch above "Good Vibrations." 4. The Duprees - "You Belong To Me." 3. Conway Twitty - "It's Only Make Believe." Sure, he's trying to mimic Presley but who the hell cares? The song is just rich with passion. 2. Jefferson Starship - "Miracles." You know how much I worship this song, the best single record turned out during the 1970's. Go ahead, name anything better. 1. The Rolling Stones - "Out of Tears." A deep cut off Voo Doo Lounge. Listen once and you'll love it. Listen twice and you'll see why it's an upset winner. I'm sure we'll get some responses to this one! It's a challenge every time I hear it ... who's gonna breakdown first, Michael or me? A beautiful song through and through ... but when his voice cracks, it's all over for me. Gets me every time ... I've watched Burton sing this live in concert and honestly don't know how he gets through it himself. It hit me deep the very first time I ever heard it ... and I've loved it ever since. This one never really hit me until my own daughter got married ... now I swear it gets me every time. Still powerful stuff, even once you know the ending. Frannie swears she's seen me tear up during The Mamas and the Papas version of "Dedicated To The One I Love" but I don't recall ever doing so. I love their version ... and I think it's a great recording ... but I don't recall ever getting emotional about it. And there are others that hit you out of the blue just because of the mood you may be in on any given day ... songs you've heard a thousand times before that never had that effect on you and then all of a sudden, BOOM, it hits you out of nowhere. Usually after that they just go back to being great songs ... but you never forget the emotional experience they gave you during that one particular moment of weakness. Looks like you and I discovered some of the same online "info" on the recording of "Ode to Billy Joe". I thought it was a stretch for the song to be over seven minutes, only to be trimmed down for airplay. I think it's great when a songwriter like Bobbie can deliver lyrics that are ambiguous. The group, America's songbook is full of those kind of verses. To be honest, after Billy Joe and girlfriend threw something off the bridge, I thought he went back by himself to retrieve it, and accidentally drowned! I just hate how the cheesy movie forced all of us to conclude what "really" happened. Better left alone to let our imagination paint the picture. 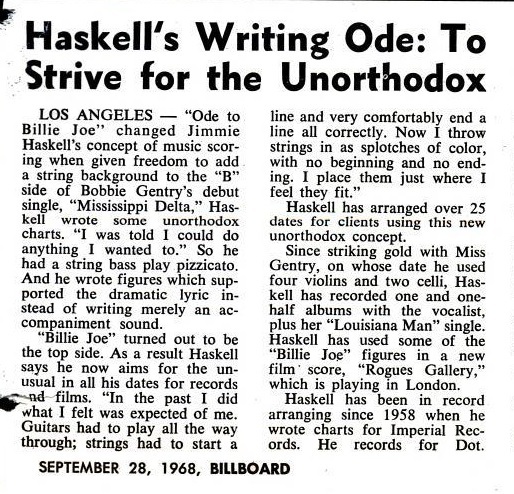 Attached is a Billboard article about Jimmy Haskell confirming Ode was the intended B side. This is from 1968, not something written 20 years later. Also the old Billboards on line indicate Mississippi Delta charted overseas. Truthfully, it probably makes the most sense to reference material that was out at the time when it comes to anything relating to Bobbie Gentry and/or "Ode To Billie Joe" ... especially since she hasn't spoken a word about it in the nearly 50 years since! Regarding "Ode To Billie Joe," Mr. Diehl is entitled to his perceptions -- but that's what they are: his perceptions. I stand by my research, which was compiled from many, many sources. Only Bobbie Gentry herself can settle the lingering questions about her classic hit and at the present time she doesn't seem too interested in talking. Therefore we have to go by established facts plus what she did say while she was still open to the press. Whether or not there is or isn't an intact seven-minute version of "Ode To Billie Joe" in the Capitol vaults does not mean that one was never recorded. According to my research, the 4:13 released version of "Ode" (with the added strings) was a cut down from a seven minute original track -- which, as noted, consisted simply of Bobbie singing to her own single guitar accompaniment. If so, Capitol could have easily simply discarded the removed section(s) and their edits buried under Jimmie Haskell's string enhancements. As it turns out, Billie cut a seven-minute DEMO version of "Ode" and presented it to Capitol (see story below). It appears that her original Capitol studio recording was also seven minutes, which the label cut down. While only Bobbie could tell us for sure, every published report I researched indicates that Bobbie's original conception of "Ode" -- be it the demo or the studio performance -- ran seven minutes. The idea of a record company insisting on shortening a song before release is nothing new. When The Browns went in to record "The Three Bells" in 1959, producer Chet Atkins told them the song was way too long to be commercial and had them cut the song's timeline down to only three phases of Jimmy's life: his birth, his wedding and his passing. The other verses -- which The Browns sometimes included in their live performances -- were deleted. Incidentally, I never speculated as to what any additional verses of "Ode" might have contained as I do not know and am not one to guess. If I ever get to interview Bobbie directly, I'll probably ask her that, but I am not holding my breath. As I wrote, Ms. Gentry was signed to Capitol on the strength of "Mississippi Delta," which Capitol's Kelly Gordon thought would make a fine A side. Yes, Bobbie had performed live and even recorded before, but, according to all published reports, at the time she was hoping Capitol would pick up "Mississippi Delta" as a SONG to be recorded by one of their established artists. She was thrilled when Kelly was equally impressed by her VOCAL and signed her as an artist. The copyright date on a composition has nothing to do with when a song was written. It could have been five minutes or fifty years before. As the holder of many copyrights myself, I don't necessarily copyright everything I do right after I complete it. Depending on what it is and its public release date, I may wait weeks, months or even years before I file for copyright registration -- and when I do, I often group a number of things under a single copyright. It's cheaper and easier. Therefore when Bobbie's compositions "Ode To Billie Joe," "Mississippi Delta" and her other works were formally copyrighted has nothing to do with the exact dates upon which they were composed. Grammy-winning "Ode to Billie Joe" string arranger Jimmie Haskell sets the record straight on his initial meeting with Gentry (she liked his beard), Capitol being initially embarrassed by the "Billie Joe" recording, and how the alluring songwriter handily dealt with the musician who claimed he produced it. Believe it or not, the easy-going and forthright gentleman briefly dated the girl with the most beautiful legs ever. Once she became wealthy, Haskell analyzes whether fame and fortune affected Gentry's personality in an adverse manner. A glaring example: what occurred backstage at a Memphis Symphony concert when a facility manager did not meet her demands. Do you recall what projects you worked on with Bobbie Gentry? Ode to Billie Joe , The Delta Sweete , and Fancy  are the three studio albums that I contributed to. Shorty Rogers did most of the arrangements on The Delta Sweete. He was an excellent arranger and a really good guy. He died too early. I do recall arranging “Okolona River Bottom Band”, which was released as a single from the album. What do you remember about your first meeting with Bobbie? The Checkmates, Ltd. recording had been set-up the week before, and I had written arrangements for that session. Capitol liked them, so they signed them to make inroads into the R&B field. They were a pretty good group featuring both black and white members. They had a couple of minor hits [“Black Pearl”, produced by Phil Spector, was their biggest at No. 13 Pop in 1969]. Bobbie spoke up and said, “I like your beard!” So I decided to keep it [laughs]. That was really her only remark during the session. I asked, “What should I write on it?” because up to that point, I was used to people telling me, “Oh, I want something here, something there.” They would even give me instructions or sing it to me. But Kelly responded, “Just put strings on it so we won’t be embarrassed. It’s a record with only a girl singing and playing a five-string guitar” [laughs]. How did you come up with the “Ode to Billie Joe” string arrangement? People ask me how I get my thoughts. I think I get ‘em from God ... because I sit there, and I sit there ... and then I play the song for awhile until it’s in my head. I’ll go about my business until all of a sudden, the ideas come to me. I write as fast as I can on paper before I forget what I just heard in my head. I think it’s a wonderful miracle. That’s one of the things that happens to most arrangers I have found. Thoughts just pop into their head. I think the same criteria applies to songwriters. Who knows where it comes from. Some folks liken it to the “Universal Mind” concept. After awhile I got to thinking, Bobbie’s lyrics are like a movie, so I composed the string arrangement as if it were a movie. For some strange and miraculous reason I was told to hire four violins and two celli (aka cellos). Usually it would have been four violins, one viola, and one cello. I say miraculous, because I was able to use one cello to play a pizzicato bass part, and the other cello to play a traditional bowed string part. I thought, What’s my cello player gonna play that has the fewest notes? Well, I figured out a bass line with only three notes every two bars. It was, “Doom, [snaps fingers three times], duh doom [snaps fingers three times], doom. Every once in awhile the player might add an extra note. Kelly listened to the first rehearsal. Then he walked over to where the cello was playing [it’s called pizzicato when you pluck the strings]. Kelly kneeled in front of the cello and put his ear near the f-hole [on stringed instruments, it sounds like a dirty word but it’s because it is shaped like the letter “F”] and remarked, “Keep playing.” Kelly then asked his engineer, Joe Polito, to put the mike right on the cello. And Kelly got a good sound. I decided I couldn’t write too much, so after the introduction there isn’t much going on with the violins. But the cello is still playing along with Bobbie’s guitar. As it turned out, all Capitol had to do was pay the string players overtime. The Musicians’ Union eventually didn’t allow arrangers to score music for two artists on the same date. Kelly Gordon told me a story one time. After we recorded “Ode to Billie Joe”, there was an A&R meeting upstairs. The president of Capitol Records at the time was Boyle Gilmore. The single was 4:15 minutes long [it had already been edited down from a seven-minute version]. In those days, people were striving to release records that were only two minutes or two and a half minutes long. Disc jockeys would be more inclined to play a short record, since they could get more records in between commercials. Boyle put his arm around Kelly and inquired, “Why did you make a record that ran more than three minutes?” Kelly shot back, “Well, why did you choose it?” [laughs]. Was Kelly Gordon an underrated producer? Kelly was an excellent producer. During the recording sessions, Kelly was always in charge. He was a very exuberant fellow. Kelly had good ears, and he knew how to communicate with people. Did you know he co-wrote a song called “That’s Life” for Frank Sinatra? [Haskell softly sings, “That’s life, that’s what the people say”]. It was a big hit. He was a pretty good songwriter. I was very pleased to work with him. Kelly knew what he wanted, and he knew how it should be done. I liked his attitude and his thinking. Sometimes a producer doesn’t know what he’s talking about, but Kelly knew. Capitol asked Bobbie to record a full-length album. She and Kelly had already picked the tunes before I arrived to add the arrangements. When I got there, Bobbie began to talk more and add suggestions here and there. She always remained respectful of Kelly and me. I think we had a good time recording. Kelly eventually fell in love with Bobbie and left his wife and kids in San Diego and moved in with her. After awhile, she got tired of him and kicked him out. A few years later she heard he was dying of cancer. Bobbie invited Kelly back to her spare house behind her house, and she took care of him until he died. The gritty rock and roll “Mississippi Delta” sticks out like a sore thumb on the Ode to Billie Joe album. That was the only song on the album where I had nothing to do with the arrangement. There was something infectious about “Ode”, something that appealed to people more than “Delta.” She was just another rock singer on "Delta." You won a Grammy for Best Arrangement Accompanying a Vocalist for “Ode to Billie Joe” in February, 1968. What do you remember about that moment? I knew I was nominated for the award, but I didn’t really count on winning. It was held at the Hollywood Palladium. I was sitting there with my wife and kids. They called my name, and I simply walked forward and got it. It was wonderful. Bobbie won three Grammys that night, too, including Best New Artist and Best Vocal Performance by a Female. I wrote a song in appreciation to Bobbie called “Owed to Bobbie Gentry” [available on the extremely hard-to-find vinyl only French Horns Volume Two, 1968]. I put it in minor, and I liked my melody. I got the same rhythm feel as “Ode to Billie Joe,” but I had French horns on it. Now that I think of it, I also covered “Ode to Billie Joe” on that record. Did folks try to take advantage of Bobbie before she became successful? She quickly replied, “Let me use your previously booked studio time and record some of my demos.” Now you know how she recorded “Mississippi Delta” b/w “Ode to Billie Joe,” which ultimately became her first Capitol single [deejays preferred the B-side, so they flipped it over]. Bobbie immediately called up Paris and asked him where her $500 was. Paris sheepishly replied, “I’m sorry, but I was really down and needed the money. So I spent it.” She went, “Okay, you’re off the record. You’re not my producer anymore. You’re not sharing anything with me.” It was the biggest mistake Paris ever made [Author's Note: Paris apparently had the last laugh. In 1975 he sued Gentry for one percent of her Capitol royalties based on their original verbal agreement. He won the case and the singer paid him $35,000 to settle the judgement]. There was a rumor going around that someone else had written “Ode to Billie Joe.” I mentioned that to Bobbie. She said, “If they wrote it, why don’t they show up and claim it?” [laughs]. When Bobbie became wealthy, did it affect her personality? I think she was a little more exclusive and a little more reclusive. Up ‘til then, she was trying to make it. I don’t suppose she really changed. She could simply afford to become more reclusive. In the early days, she said to me, “Jimmie, I’m gonna be rich. My mother’s been married twice – once to a regular guy and then to a rich man. I like being rich. If I don’t make it in music, I’m gonna start a company and make really inexpensive dresses out of burlap bags.” She already had great business savvy. Eventually she bought a big house up near Laurel Canyon. By the way, Bobbie was working in a little club in Glendale at the time she recorded “Ode”. She wouldn’t tell me where the club was because she didn’t want anybody to see her working in a less than perfect light. I replied, “Sure thing, Bobbie.” Then she exclaimed, “D*#n, I’m freezing!” I said, “Why don’t you turn up the heat?” She said, “I can’t. My gas has been turned off for non-payment.” Within a year, she became a millionairess. If not a millionairess, then close to it, because of her publishing royalties. I actually went out with Bobbie a few times. I thought she was very pretty. My wife and I had separated at the time, and we were thinking of having a divorce. Luckily for me, that never went through because my wife is wonderful. I remember taking Bobbie out to lunch. When a friend of mine in the music business remarked, “Why can’t you see me today?” I replied, “I’m going to lunch with Bobbie Gentry.” He blurted out, “Oh, the girl with the big nose!” I had never thought of her that way. I only thought of her as the girl with the great legs [laughs]. In addition, she had a great songwriting ability. She said, “Listen you, I don’t work for the phone company” [laughs]. Bobbie was definitely a firecracker, very strong-willed. After The Delta Sweete was released in April 1968, you parted ways with Bobbie for two years. How were you reunited with her? Producer Rick Hall of FAME Studios wanted to record with Bobbie, and he liked my work on “Ode”. He asked me to write the arrangements for the Fancy album, so I traveled over to Muscle Shoals and had a wonderful time. They brought the violinists in from Memphis, and they were pretty good. I was very pleased to do that. “Fancy” consisted of a lot of words moving at a fast pace, and it was a very impressive, clever song. About eight years later, Bobbie had signed with Warner Bros. after the success of the Ode to Billy Joe film . She returned to Muscle Shoals and worked with Rick on a single – “Steal Away” b/w “He Did Me Wrong But He Did It Right” [Author’s Note: This became Gentry’s final studio session. She recorded a number of songs with Hall that sadly remain unreleased]. Bobbie was wearing a cute little white fur jacket. I said, “Gee, Bobby, you’re looking pretty good in that. I guess you’re doing well since you married Jim Stafford.” She snapped at me, “I paid for it myself!” [laughs]. Why do you think Capitol Records dropped Bobbie? I don’t know if Bobbie would want this to be known, but I heard the main reason she was off Capitol is because she became difficult to deal with. By this time, Kelly Gordon was ill and not working with her. The A&R folks felt she was not worth worrying about. Another reason had to do with her final album, Patchwork , not selling very well. I did two concerts with her – one was with a band in Carbondale, Illinois, at a racetrack. And then there was the Memphis Symphony. She asked me to write a couple of arrangements for her Memphis show. Evidently, she was giving him a hard time. Bobbie was in her dressing room, and her window wouldn’t open. They had to find somebody to open the window. Little things like that. And there was some item that management had forgot to put in her dressing room. After the concert had ended with the Memphis Symphony, we were backstage when Bobbie introduced me to her grandmother. She said, “Grandma, this is my music arranger, Jimmie Haskell.” Her grandmother remarked, “Oh, what a talented person you are. I like your work.” Bobbie quickly added, “You oughta, I’m paying him enough!” [laughs]. Did Bobbie eventually become an arranger? When did you last speak with Bobbie? I recommended a copyist who could listen to her record and give her a lead sheet. That’s all she was looking for. But she wanted me to do the lead sheet. She never contacted the person I recommended, and she hasn’t spoken to me since. There again, because she wanted to do it herself. Something within her does not allow her to think that anybody else is helping her. Let’s put it this way – you are a well-rounded person. You think nice, and you are a gentleman. I don’t think that applies to her [laughs]. She’s a very willful girl. Bobbie won’t let anybody say no to her. Well, you can say it to her, but she won’t speak to you again [laughs]. Really weird. By now she probably thinks I’m too old. Maybe when one of these three recent artists that I worked with [Jessie Baylin's Little Spark, Joshua Radin's Underwater, and RDGLDGRN (aka Red, Gold & Green, featuring the production talents of Pharrell Williams and the drumming of Dave Grohl)] makes it to the top, she might call me again. What are some of your favorite Bobbie Gentry recordings? I like most of what we did on the first album, "Ode To Billie Joe." "Bugs" was an album cut on there that I had a lot of fun doing – arranging those pizzicato strings. Of course, she wrote some great songs, in particular “Ode to Billie Joe.” That will always be her main legacy. Who knows? Maybe Bobbie Gentry will learn about this discussion in "Forgotten Hits" and agree to clear the air. I hope so. I'd love to talk to her. As I also noted, the mere mention of her name always brought a smile to the lips of Bill Drake, who'd then tell me what a warm and wonderful woman she seemed to be to him. "The History of Rock 'n' Roll"
When the new Monkees album was first announced, it was widely reported that while Michael Nesmith would appear on the LP, he would have very little to do with it ... yet, as it turns out, he sings and/or performs on EIGHT of the LP's thirteen tracks, including a couple of stand out performances. Well, last week, he joined The Monkees on stage in New York ... via SKYPE!!! It was to perform one of his early Monkees favorites, "Papa Gene's Blues" ... and it had to be a real treat for the audience to see. I was surprised that you liked the album. The reason is that when I read your reviews you and I don't usually agree. But this time we do, for the most part. It is one of the Monkees' best albums since Pisces, Aquarius, Capricorn and Jones, Ltd. If there was an album to rival it since that album it would be Head. The one place were you and I don't agree is on the song Little Girl. I found it to be catchy and Peter's best vocal ever. He is more the instrumentalist in the group and not the best singer. However, on this song I felt his singing was better then ever. I didn't care for his second choice on the album, but I never cared for that song anyway. I do agree with you on the song Love to Love. I like the song but it sounded too much like 1967. I would have hoped that they would have changed the sound to update it for 2016. I hope that Mike wasn't on the song because he had something that just kept him out of the studio that day and not that he didn't like Davy. On the song Give It Time I know it only shows Micky as the only Monkee on the recording but I could swear that I hear Mike singing background. Those are my thoughts on the CD. Thanks for sharing your review with us. There is a "deluxe" edition of the new Monkees CD that offers two bonus tracks ... an alternate version of "Me And Magdelana" (a bit more uptempo) and a track called "Terrifying", which is another Micky tune. I'm not sure why these songs weren't included on the regular CD but, as a Monkees completist, I just HAD to have them! I wrote this review before reading your review of the Monkees CD. As I have mentioned, the new Monkees CD has grown on me after multiple listens. Still, it has more fab four sounds than pre-fab four, to me. I actually feel that the title and first song written by Nilsson, "Good Times," is the song that best represents the OLD Micky vocal sound, not unlike "I'm a Believer." There's good reason for this, as the vocals are done by both Dolenz and Nilsson in 1968. Harry takes the second verse lead vocal. Music is added from 2016, as well as original music. If you've ever read the Laurel Canyon book, you'll find that Dolenz recorded the hitmakers at his home studio constantly on his own. Maybe he is getting around to letting us hear some of these things. "You Bring The Summer" is a pretty good pop song, very much like "That Thing You Do!" Despite this being written by one of my 80's heroes, Andy Partridge of XTC, it is a later song on the CD that is more alike XTC, IMO. "She Makes Me Laugh" has grown quite a bit on me. Of course, it steals quite a bit from "It Won't Be Long" from the Fabs in several ways musically (such as an exact guitar lick from the song). "Our Own World" starts with opening licks that are quite like McCartney's great solo 45, "I've Had Enough." This song is also written by the CD's producer who wrote "That Thing You Do!" There are harmony vocals that remind of "Taxman." Then, throw in a bit of vocalizing similar to Andrew Gold's classic "Never Let Her Slip Away" (in my top 5 of 1970's). Of course, you can also start the song and start singing "Cuddly Toy" (another Nilsson song) along with the music, so it has Monkees ties, too. Good tune. I've already mentioned "Gotta Give it Time" being much alike the Professor Morrison's Lollipop song "You Got the Love" from 1967. Both co-written by Joey Levine, the voice of those 60's bubblegum hits and "Life is a Rock." Wow, just saw that the original parts of this recording are from Jan, 1967 and thus was recorded pre-Prof!!! "Me & Magdalena" is a beautiful ballad, unless you prefer the equally cool bonus track version which is pure pop. "Whatever's Right" is possibly the most Monkees sounding of the bunch? This one is classic WONDERS fodder, IMO. Could have easily been a Tom Hanks movie song. The fact that it is a Boyce & Hart (Last Train to Clarksville, Valleri) song makes it even more convincing. "Love to Love" was a Neil Diamond tune on his Bang albums and recorded over three session in 67 and 68 as well as added music this year for this version. Rhino put out a version a decade or more ago. Classic Jones. NOT a classic Diamond song, however. "Little Girl" is Peter Tork's current written and sang song on the CD. Not bad for the guy who didn't sing much before either. To me, "Birth Of Aan Accidental Hipster" might be my fave song on the CD ... Nesmith doing his new "Listen to the Band" in a way. This has those XTC Dukes of Stratosphere sounds as well as Beatles psychedelic stuff ala "I Am The Walrus." Of course, backward guitar, too. There may be rumors started that this Monkees is actually Klaatu also! "Wasn't Born To Follow" is, of course, the 1960's Byrds tune penned by Carole King and Gerry Goffin. This was partially a 60's recording, too, with Tork vocals and banjo. Really not good, as could be expected. "I Know What I Know" is a beautiful Nesmith tune that is the best slow song on this for sure. Really a nice tune. His "Imagine"???? "I Was There" is certainly Dolenz' attempt at "Why Don't We Do It In The Road" in some aspects. It certainly smacks of Lennon's echoed vocal style in many, many ways. "Terrifying" is a nice old styled Monkees sounding tune. The second "Me & Magdalena" is more upbeat and very jangly guitar reminiscent of a 60's Byrds style. Both bonus tracks well worthy of being on the normal song set of this CD. All in all, not really as Monkees sounding as I expected, but nonetheless, worthy of its' place in Monkees history. The music world is mourning the loss of Muhammad Ali who passed away Friday night at the age of 74 from complications due to Parkinson's Disease. Among them are: Paul McCartney, who, along with The Beatles, met Ali, then known as Cassius Clay, on February 18th, 1964 in Miami: "Dear Muhammad Ali. I loved that man. He was great from the first day we met him in Miami, and on the numerous occasions when I ran into him over the years. Besides being the greatest boxer, he was a beautiful, gentle man with a great sense of humor who would often pull a pack of cards out of his pocket, no matter how posh the occasion, and do a card trick for you. The world has lost a truly great man. Love Paul"
Ringo Starr: "God Bless Muhammad Ali - Peace and love to his family." Estate of George Harrison: "Condolences to Muhammad Ali's family, friends and fans..."
Elton John: "What a kind, special man. I treasure my moments spent with him. Bless you forever, you gentle warrior." Bono: "The greatest at not reminding you he was the greatest. A lesson in grace. This is us at the launch of the drop the debt campaign in London, February 1999. There was some resistance. He whispered in my ear "expect it." Dave Mason: "Fellow poet. Rest in peace Champ." Bret Michaels: "Muhammad Ali was truly an inspiration not only as an athlete and boxer, but as a fighter in life. I had the honor of meeting him and his amazing family at Fight Night in Arizona after my brain hemorrhage. Sharing such a great cause to raise money for and Muhammad’s inspiration made the fight in me stronger. To his family and friends, you are loved and the man will be missed. He was a legend in and out of the ring." Brian May: "An inspiration to millions." Paul Stanley: "THE GREATEST has died. Nothing else need be said." James Young from Styx: "I was a huge fan of this great man from early on. Before he became Muhammad Ali, he actually put out a spoken word album with him pontificating about life, etc. I bought it and loved it ... One memorable quote from that filled-with-bravado LP was - 'If Cassius says a rooster can lay an egg, don't ask how, GREASE THAT SKILLET..!!'" Gene Simmons: "He was the greatest." Joey Kramer: "Float like a butterfly sting like a bee the hands can't hit what the eyes don't see." Michael McDonald: "Honor, conviction and clarity are things that make for a true moral compass and sense of justice. At the end of the day, someone worth our admiration. Thank you Muhammad Ali for your example of courage and wisdom in this life." Cindy Blackman Santana: "RIP Muhammad Ali - the Greatest! Thank you for all of the excitement, joy & leadership that you gave to us!" Sammy Hagar: "The greatest of all time without a doubt. Gone! Can't believe it. Sad day indeed." Brian Wilson: "Very sad to hear about Muhammad Ali’s passing. He really was one of a kind and will be remembered forever. Love and Mercy to his family and friends." Rolling Stone Magazine ran a nice piece with Ringo Starr, talking about the day The Beatles met Cassius Clay in Miami when they were down there filming an appearance for "The Ed Sullivan Show". Neither future icon really knew who the other was. 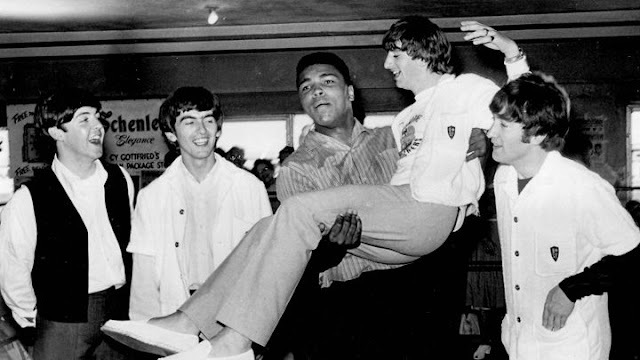 A photo of Clay throwing a punch at all four Beatles and having them roll back dominoes style was seen around the world ... but here's a rare shot of Ali picking Ringo up, a completely impromptu, spur of the moment thing according to Starr. It's been said that Cassius Clay had no idea who the Beatles were when they showed up at his gym, where he was training to fight then-current title-holder Sonny Liston. Robert Lipsyte, a future Ali biographer who was covering the meeting for The New York Times, claims that Clay uttered a bemused "Who were those little sissies?" as soon as they were out of earshot. According to Starr, the feelings were mutual – minus the sissy part. "In all honesty, we didn't know one boxer from another," he recalls. "That's how it worked out – somebody set it up." Even casual observers like the Beatles believed Liston to be the likely victor. Vegas odds-makers projected him winning by a sizable 8-1 margin, and the band initially grumbled that they were getting time with, in John Lennon's estimation, "that loudmouth who's going to lose." But they were quickly won over by Clay's magnetic charm and a comedian's instinct that rivaled their own. Soon they were all clowning around the boxing ring for photographers, with the Beatles playing the good-natured victims of Clay's lethal fists. The photos all look so perfectly choreographed, like a lost scene out of A Hard Day's Night, though Starr insists that they weren't staged in advance. "We did them on the day," he says of the poses. "His cross to bear was that everybody you see him in a photo with – whether it's Mandela, on a talk show, anybody – it's always the punch photo." He chuckles, adding capitals with his voice. "It's always 'The Punch Photo'! We were 'The Punch Photo'!" Photographer Harry Benson took the definitive image, which shows Clay sending the mop tops colliding into one another with cartoonish ferocity. "And then he's carrying me. I don't know why, he just picked me up!" Starr says. "It wasn't like, 'OK, pick him up now!' He just suddenly did." Surely there must have been some sort of warning? "No, he just grabbed me and lifted me up! What was I gonna say? 'Hey, come outside. …'" The drummer raises his fists, but his mock-tough expression quickly breaks into a grin. "We only got out of the ring because he put me down." When all was said and done that day, the Fab Four knew who they would put their money on. "We had it on him! He's the Kid!" Also from Rolling Stone earlier this week ... news of a complete ABBA reunion ... in SONG ... celebrating their 50th Anniversary ... the first time all four members have sung together in over thirty years! ABBA celebrated the 50th anniversary of their founding by performing onstage together for the first time in 30 years. Agnetha Faltskog, Björn Ulvaeus, Benny Andersson and Anni-Frid (Frida) Lyngstad were all in attendance at Stockholm's Berns Salonger Sunday for a private gala honoring the influential pop group, and while the quartet stood onstage together to discuss their career with attendees, ABBA sang a rendition of their 1980 hit "Me and I," Sweden's Expressen reports. At first, Lyngstad and Faltskog sang the track together as a tribute to Andersson and Ulvaeus, but soon the male half of ABBA joined in toward the end of the song to cap the reunion. The impromptu performance marked the first time since 1986 that ABBA has played music together onstage in public. Since then, the quartet has reunited sparingly, mostly for promotional purposes: In January, ABBA staged a rare four-member reunion at the opening of Mamma Mia! The Party in Stockholm, a gathering that represented the first time since 2008 that the group was photographed together, EW writes. In 2010, after it was revealed that ABBA would be inducted into the Rock and Roll Hall of Fame, Andersson announced that the quartet would not reunite at the induction ceremony for a variety of reasons, including Faltskog's reluctance to fly. "Agnetha is not flying, so I don't know how she's going to get to New York," Andersson told Rolling Stone at the time. Despite a rumored billion-dollar offer for a reunion tour, ABBA have refused to get back together – both couples, Lyndstad and Andersson as well as Faltskog and Ulvaeus, divorced in 1980 – making their Sunday performance all the more improbable. "It was absolutely amazing. A lot of emotions," Lyngstad told Expressen of the reunion. "We've made this journey throughout our history. Benny and Björn in particular. It's been very nostalgic." While no video from the "Me and I" performance has emerged, a few photos of the reunited ABBA have been posted on social media. It was 40 years ago today (June 6th, 1976) that “Shannon” peaked at #6 on the Billboard Chart. Time flies when you’re having fun! Cool! New alternate "Lazy River" w bobby's spoken intro being uploaded today :). Thanks Kent! Keep up the great work! New York, NY (June 6, 2016) -- In November, 2014, a helicopter landed at the infamous Hard Rock Hotel as KISS invaded Las Vegas for an historic nine-show run. Now, fans will be able to experience this spectacular night for themselves in their own homes as ‘KISS Rocks Vegas’ hits PPV in North America – available via cable, satellite, and online. From this blistering live show, fans can expect sky-high flames, ear-bursting volume and a few drops of blood! As America’s #1 Gold Record Award winning group of all time, and that’s in every category, KISS can easily be named one of rock’s most influential bands. The Rock N Roll Hall of Famers have released 44 albums and sold more than 100 million albums worldwide. Additionally, KISS were recently honoured by their peers, having received the illustrious ASCAP Founders Award in 2015. Paul Stanley (KISS lead Vocals, rhythm guitar): “See us from the comfort of your couch with the awesome power of surround sound. Feel like you are in Vegas and don’t be shy. ‘Shout it out loud”! Over the course of 40 years, KISS’ record-breaking global tours have brought them to fans around the world. The band kicked off their recent world tour with five headlining shows in Japan and a #1 single in 2014, “Samurai Son”, with Japanese pop group, Momoiro Clover Z. Their 40th Anniversary World tour also rocked North America, South America and Australia. Furthermore, once a year the “KISS Army” becomes the “KISS Navy” as fans from across the globe board the KISS Kruise (2016 year will mark their 6th voyage). KISS teamed up with Warner Brothers in 2014 to create the well-received original movie ScoobyDoo and KISS: Rock and Roll Mystery. Other high-profile appearances have included the Super Bowl, the Winter Olympics, Rockin' The Corps concert, a FOX alliance with KISS appearing in multiple episodes of Family Guy, plus two special guest performances on American Idol finales. KISS has been featured in major advertising and marketing campaigns for John Varvatos, Google Play, Hello Kitty — even appearing in a Dr. Pepper Super Bowl commercial and advertising campaign in support of their Hottest Show On Earth tour. This year represents the 3rd season of the LA KISS Arena Football League team bringing professional football back to Los Angeles. KISS founding band members Paul Stanley and Gene Simmons have also entered the culinary world by opening a string of successful restaurants aptly named Rock & Brews. For more information and to purchase digital PPV go to Kissonline.com or check your local cable provider for more info.